John and I discuss Dan S. Kennedy’s No BS Sales Success from the point of view of what we’ve learned from our Aviation Sales & Marketing practice. Paula Williams: Welcome to our book club discussion. This week, we are talking about the No BS Sales Success book by Dan S Kennedy, one of our very favorite people and I mean that in the nicest possible way. John Williams: He’s actually, besides being a good author and a good marketing person, a very interesting guy to talk with. Paula Williams: Exactly. Disclaimer, we’re part of one of Dennis Kennedy’s marketing mastermind groups and continue to be part of different things going on at the GKIC Organization, which is one of his companies. John Williams: Speaking for yourself. Paula Williams: Exactly, and we’ve done a lot of different things with different members of that group and it’s a lot of fun. First of all, let’s talk about first impressions about the book. I know some of the folks in our group that I talked to are not crazy about Dan Kennedy and not crazy about his style. 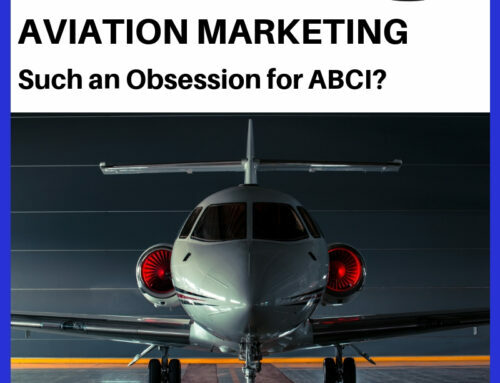 There’s a lot of what he talks about that would be more appropriate for different markets than business aviation. John Williams: You might say that, but on the other hand, you cannot argue with success. Paula Williams: That is true, and actually, I think most of the systems that he sets up and most of the techniques that he recommends, he has really good data and we’ve never gone wrong when following one of his formulas. We may need to tweak some of the style and do some things a little bit differently because aviation is different from the rest of the world, of course. John Williams: Sure, but the people who say blatantly I’m not going to do that because I don’t like the style, I say that’s okay, do you want to make money or do you not? Paula Williams: Exactly, and once again, in marketing, it’s not always about what you like, it’s about what works. Paula Williams: That’s one of the biggest take aways that I think that I’ve learned from Dan Kennedy is the difference between what they call direct response marketing and brand marketing. 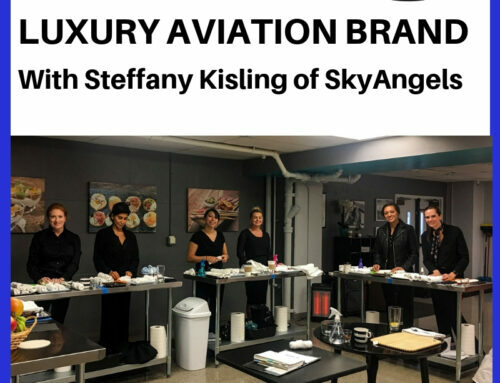 Most of the marketing that’s been done in the aviation industry that we’ve seen has been brand-based marketing. Paula Williams: Which is kind of the shiny, glossy, beautiful look at me, this is my company, here’s a picture of a beautiful plane. You should do business with us for no particular reason other than the fact that we are just cool. Paula Williams: Direct response marketing, on the other hand, has very specific offers. And for smaller companies, especially in aviation, where you’ve got small to medium size companies that don’t have a huge budget but need to look like they do. I think the direct response is a lot more targeted and a lot more measurable, which is really important to our customers. John Williams: That should be important to almost everybody, except the guy selling the widget for $0.50 for a billion, get in and get out. Paula Williams: Exactly, so we’ve gotta limited audience in aviation. We’ve got very smart customers in aviation. All of that adds up to the more targeted, the better, so it’s really worth doing the extra effort to do targeting. As far as the book itself goes, I thought this was one of the easier ones or faster to read anyway of the 12 that we’ve been doing this year, would you agree? John Williams: Well,it was for me but then Dan and I think a lot alike. [LAUGH] It was a rehash of stuff that I know that you do. Maybe a little different style, but you do all this stuff. So it was just like yeah, I knew that. Paula Williams: I knew that, [LAUGH] so nothing really new? No fabulous revelations or anything? John Williams: I don’t recall anything that was so new that I just set back in my chair. Paula Williams: Just fun ways of applying stuff that you already know and that’s always useful as well, this time we we were reading August, the hottest month of the year, so summer reading is a good thing. John Williams: Actually, the one that I hadn’t considered was the dumbest things that says people do but we’ll get to that. Paula Williams: Absolutely, again, I really like a lot of the humor that he puts into his work and he will tell you that teachers make less than entertainers. So no matter what it is that you do or what it is that you sell, if you can be entertaining, that’s a thousand times better than just being educational. But we’ll get to that and that’s just basically on style. First of all, page 16, this is one of the first chapters in the book, the positive power of negative preparation. I think most aviation sales folks do way too much of what we call winging it. Paula Williams: They just show up, they think their product’s going to sell itself. They think all they have to do is read the product sheet and the customer’s just going to see the sense in it, and come to the profound revelation that all their life they’ve been doing things wrong and change their way of doing things, change their business model and everything else to accommodate your product. John Williams: Which never happens. Paula Williams: Which never happens, in fact, we just had a conversation with the client today talking about the difficulty and how everybody underestimates the difficulty of making people change their behavior even if you can prove that your product is going to make their life easier. Paula Williams: Nobody cares, nobody’s going to try your new mousetrap unless you can absolutely get their attention and then convince them. John Williams: Because they’re all going to say, I have a mousetrap, it’s already working. Paula Williams: So I really don’t care your mousetrap. John Williams: Why should I have a better one? Paula Williams: I’m not in the market for a mousetrap. [LAUGH] Exactly. What I like about this is the dichotomy of Norman Vincent Peale on one side, the positive thinking can overcome any obstacle versus the Murphy’s Law, anything that can go wrong, will. You actually saw the statue of Eddie Murphy, didn’t you? Paula Williams: A plaque, a frieze, a mural? John Williams: Yes, a plaque on a post there, he’s got his own little stall, talks about Captain Ron Murphy, I don’t know if it’s Edward Murphy, but I thought it said Ron, but maybe not. Paula Williams: How he came up with the Murphy’s Law, which is that anything that can go wrong, will. What this really amounts to is if you are a salesperson, you can use both of these things to your advantage if you can brainstorm ahead of time, what can go wrong in the sales presentation? What are the objections that people might bring up? Obviously, it costs too much. It’s going to take too long to put into production. We’re already happy with what we’ve got. All of the different things that people could tell you and you want to take those very seriously and you want to come up with a solution for each of those before you get in the room with your customer. John Williams: You need to know their processes and how the company works with respect to your product. John Williams: Hell, even Patton. John Williams: He [LAUGH] long as he got. Paula Williams: He read Rommel’s books. John Williams: He said got ya. Paula Williams: Yeah. And then after the battle he told him, I read your book [LAUGH] right. You have to know and it’s not that the customer’s your adversary, but you have to know as much as you can about them so that you’re not wasting their time. I think unprepared sales people are the bane of the existence of every executive in the aviation industry, right? John Williams: Yeah, not just aviation, but US aviation for sure. Paula Williams: Right, you don’t want to waste anybody’s time. And this is how you avoid it, is you use Murphy’s law, way ahead of time and you think of all the possible things that could go wrong or that people could object to and you use positive thinking to come up with ways around each of them. John Williams: And you research the company you’re going to sell to. Don’t just go into the call and not know anything about them. Paula Williams: Right. And this is whether you’re doing a sales presentation in person or on the phone. Paula Williams: Right, even the first time you talk to somebody, there’s no excuse not to have Googled their company and read the About Us section of their website and have a clue, right? Paula Williams: But, you wouldn’t believe the number of people that call us, who don’t even know what we do, right? John Williams: Yeah. And that’s interesting, because I don’t even know how they get our phone number if they don’t at least go to the website. Or that’s as far as they get. Okay. Here’s one that [COUGH] has happened to me more than once. Paula Williams: [LAUGH] Remembering why you’re there. Especially if you’re doing a public speaking event. Or lunch with a client, or something like that. It’s really easy, if you like people, and if you like your topic to get completely carried away and forget to close the sale. John Williams: As a matter of fact, we were talking to a guy in Wisconsin just a couple years ago, and I was on the phone with him, and we just got carried away enjoying each other’s conversation and the topic we were talking about, and he said fine. He said, let’s cut to the chase, what do I have to make this happen [LAUGH] . John Williams: He said that, not me. Paula Williams: Carried on from there. Exactly. But generally speaking, especially if you’re speaking to a group, you have a limited amount of time. Paula Williams: And if you’ve got an hour, you’re going to have to watch the clock, and make sure that you’re covering the key points and that you’re actually doing the steps required to close the sale, whatever that is. Whether that’s selling the next appointment, or getting a commitment on something, or getting to the next step in your sales process. So, you can’t just enjoy each other’s company and you can’t just entertain a crowd. You have to actually [LAUGH] I remember why you’re there. There’s a great story in the book about how, I think it was actually Dan Kennedy, was giving a presentation and people were laughing and crying, and getting into it and having a wonderful time, and getting a standing ovation and everything and he was on the flight home with, before he remembered, my goodness! Number one, I didn’t sell anything. And number two, I forgot to pick up the product! [LAUGH] So he had to have it mailed back to him from the convention center. John Williams: And that was early on in his career. Paula Williams: Of a successful presentation. And it doesn’t matter. It really doesn’t matter how much they like you. It doesn’t matter how fabulous the presentation is. And it does in the sense that now people have a positive opinion that they’re carrying forward, and the next time they meet you, they’re going to come to your presentation. John Williams: Having a good time! Paula Williams: Yeah, because you spent a lot of money to be there. You can only do that so many times before you run out of cash. So you want to make sure that you’re taking people to the next step in your sales process, whatever that is. It might be a baby step. It might be just put your card in a fishbowl for a drawing, or download an app. Or whatever it is, download something free, click this link. John Williams: Or sign up for a call slot, I’ve got these available. Paula Williams: Exactly, make an appointment. Whatever the next step in your sales process is. So, my advice is, number one, make that small, especially if you’re doing selling to a crowd. The first or second time that you do it, you want to make sure that you make that a baby step that you’re asking people to do. Whatever that call to action is, make sure there is one, and make sure that it’s small and not daunting for you to deliver and not daunting for them to do, right? John Williams: Had that not happened to me a couple of years ago, I would’ve looked at this and said, you’ve gotta be kidding. Paula Williams: [LAUGH] I know, I would never do that. John Williams: And I know a lot of you folks out there are going to look at that and say, yeah, I don’t want to hear it. Paula Williams: I’m smarter than that. John Williams: Well, I’m here to tell you it happened to me. John Williams: And I was lucky because the prospective client, said fine. And I said, but how will I make this happen? To myself, I said. I said, what you’ve gotta do is [LAUGH]. Paula Williams: He bailed you out. John Williams: Yeah, that’s right. I said give me your credit card number and we’re on the way. And he did, and we did, and it worked. Paula Williams: Yep, absolutely. All right, so yeah, thing number one, don’t get carried away. All right, the next item we wanted to talk about was the chapter on Proof, being the most important tool in the sales process. Now a lot of people think, all I have to do is just show people the data and say my product is better than what you’re using now. The decision is falling off a log, it’s obvious, right. John Williams: Well, falling off logs easy but this is not. Paula Williams: Exactly. There’s no such thing as falling off a log [LAUGH]. John Williams: Not when it comes to sale. Paula Williams: It is really, really hard to change people’s behavior, so. John Williams: And this slide is absolutely dead on. John Williams: You can have testimonials, pictures, charts, and graphs, and so forth, [COUGH] but you need to go beyond that and have overwhelming proof is what Kennedy calls it. John Williams: And lots of times that is just almost not sufficient. Paula Williams: Right, in fact, a lot of the clients come to us and they say, well, I’ve already got some customer testimonials, and our answer is you need more. And you need more specific ones, and you need ones that are specific to each situation that you’re selling in. He’s saying overwhelming, proof is barely sufficient. When we send a new customer packet to people, it has a page, a full page of testimonials from different people. And also a video CD of an interview with a happy customer. It’s got a case study, that’s like a two page, three page printed case study that’s nicely printed. All of that stuff goes out in a new customer information package or a new prospect information package. And we’re always looking to add things to that package because that’s when people are looking for how do I compare this marketing company with every other marketing company that I’m looking at, right? John Williams: Yeah, and even with our current clients, sometimes we want them to use a particular marketing channel. And we say that, well, we’ve got a client that sold a business using his channel. I don’t sell businesses. I said, yeah, but you know what? If you can sell a business shed in this channel, we can certainly sell your product there. Paula Williams: Right, so again, if we have those in writing and we have those that we can send to people, that’s ideal, so we’re always looking for more. And every time somebody says something nice to us, [LAUGH] we send them an email saying, do you mind if we use that in our marketing material? That’s a really good way to capture a testimonial and say, you said this about using our product. Do you mind if we use that with your name and company? It also provides a link to your company from our web page. 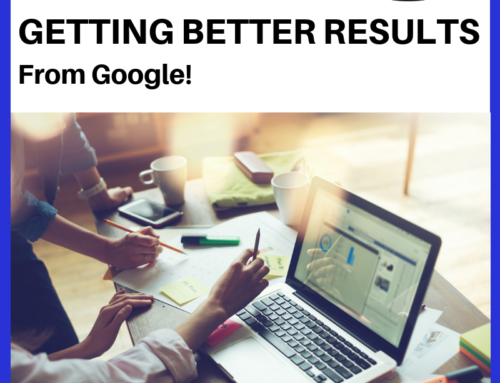 There’s some benefit to you because you’re getting more visibility for your brands. Lots of reasons that people want to do that for us, and also for our clients. So pictures, of course, worth 1,000 words, right? John Williams: Yeah, and when you think about that, if pictures are worth 1,000 words, do you realize what a video would do? John Williams: A video is 30 pictures per second. Paula Williams: Yeah, exactly, so when you’re talking about proof, having a before and after picture, that really helps people cement in their mind, okay, well, this is what they did for somebody else. This is what they could do for me. That shows the proof that you’re looking for. Product demos that are on video, those are a great way to prove this is how our product works. And once again, you’re going to need more than one thing, because [LAUGH] everybody knows smoke and mirrors and very fine wares. Everybody is so suspicious nowadays of everything, even video, so you’re going to want to have all of this, testimonials, pictures, and charts and graphs. Tanis Aircraft Products actually does a really good job of this. They show the heat maps of engines using their components, using their preheat products. And they show the charts and graphs, because they are really, really, really nerdy engineering people, and I mean that in the nicest possible way. John Williams: Yeah, but if you need preheat stuff, you don’t go to anybody else. Paula Williams: Absolutely, they are the people to go to, because they have all the data, they’ve done all the third-party testing, and they can provide all that proof. And they do it in a really nice visual format, because they’ve done the work to collect the data, and then also to provide it in really nicely visual charts and graphs, right? John Williams: Yep, and they do research in the coldest spots in the world. Paula Williams: Cold, right, so another thing that I really like is kinda the hyperbole, where they test things in crazy places. You’ve seen the infomercials where they take a screen door and they paint it with this stuff, this waterproof paint or whatever. And then they put it in the bottom of a boat and they sail across a lake. Paula Williams: If you can find a way to do that with your product, think of the most ridiculously visual example of how your product could be used. The weirdest idea is probably the best one, as far as creating some kind of visual proof that your product is the best and does what you say it does. Paula Williams: Okay, cool, so yeah, you want to be overwhelming with that, and don’t ever think you have enough, because more is always better. John Williams: More is always better in marketing. Paula Williams: Right, exactly, all right, another chapter I wanted to draw your attention to. And the reason we do this is because we know people are really busy, and a lot of these books have stuff that is sort of relevant to aviation, and some of it’s more relevant to retail. So we kinda highlight six things in each book that we read, or six or eight things that are really relevant to business aviation, right? Paula Williams: And lead generation advertising is something that is used a lot in the rest of the world. You’ve seen this all over the Internet, where people ask you to download a white paper, or get a free trial of this or that, or the other thing. And that’s what we call regeneration advertising, where they offer something in exchange for your information. Now, this was new about five years ago, and nobody was doing it [COUGH] in the aviation industry, especially. Still, aviation kind of is tailing retail a little bit, so it’s not as overdone in aviation as it is in the rest of the world. John Williams: Since we’ve been here. Paula Williams: Since we’ve been here, which is since 2009, right? John Williams: Yeah, somewhere between 06 and 09. Paula Williams: Yeah, exactly, but yeah, a lot of them are now catching up to the fact that having a lead magnet is a really good way to do a two-step sales process. And since we’re not doing retail, these are not impulse buys. It’s going to be at least two steps to the sale, so having some kind of a lead magnet. And we’ve got a tip sheet that you can download from our website with 17 call to action ideas, or 17 different lead magnets. And that includes things like free consultations, videos, tip sheets, checklists, templates. There’s lots of ways to do this, depending on what kind of a company that you have, right? Paula Williams: But this is what we call inbound marketing, where people come to you. So if you’ve got a sales team, do you want them spending their time beating the bushes and dialing for dollars? And going through the phone book or the NBAA directory and calling every single company of this type? Or, do you want to have them spending their time with people who have specifically requested a white paper from you? Paula Williams: That’s a question. John Williams: Say it again. John Williams: Sorry, the audio got. Paula Williams: Okay, do you want to have your sales team, let’s say that you have a sales team, and they’re making 50 bucks an hour, just to make the math easy, sitting in a room. Do you want those people beating the bushes, and going through the NBAA directory and dialing every business type that’s your target customer? Or, do you want them responding to people who have downloaded a particular white paper on the specific topic of the thing that you sell? John Williams: Well, anybody that’s in step two is a warm lead, and they’re a lot more interested in what’s going on. John Williams: So it makes it a lot easier to connect with and discuss your product and/or service. Paula Williams: Right, so those salespeople who are making phone calls or responding to leads, their money is going to be a much better investment for you if they’re responding to warm leads than cold leads, if they’re beating the bushes, right? John Williams: As a matter of fact, sometimes we get salespeople that are looking to change jobs. John Williams: Yeah, that’s going to increase sales, so everybody wins if you do that. Paula Williams: Their probability, right, for every single minute that they spend on the phone. If it’s a warm lead, they have a 50% better chance of making the sale, and it varies depending on the product. John Williams: We didn’t keep track of all the times those guys called us. We should have, that would have been an interesting statistic. Paula Williams: Yeah, absolutely, we should have. [LAUGH] That’s one thing, we never wish that we had measured less things. We’ve got spreadsheets for everything, and then we’re always finding things that we wish we had measured. But absolutely, inbound is far preferable to outbound, which doesn’t mean that you shouldn’t do both. Paula Williams: Because in some cases, you’ve got a product that is so new. Or so innovative or whatever that you do have to make the first contact, and maybe offer, you’re be magnet. So it’s easier to make a cold call and say, hi there, we have a checklist for companies like yours on how to save money doing X, Y, or Z.
That’s a much easier call than, hi there, buy my product that you have never heard of, right? Paula Williams: Okay, [LAUGH] so making things easier for your sales people is actually making things better for your company. Paula Williams: All right, okay, you’re favorite part of the book, right? John Williams: Well it’s not favorite but it was something that I hadn’t considered that people do. John Williams: I mean everybody knows that the you are the summation of the five people you hang out with most often throughout life. Paula Williams: So the six dumbest things that sales people do to sabotage themselves and just to-. John Williams: And within the book on number three it says no additional commentary needed [LAUGH]. Paula Williams: Right, exactly, so if you haven’t read the book, number one is Lousy Follow Up. And that is absolutely true most people don’t do nearly enough of it. John Williams: And they don’t do enough of it meaning you don’t just follow-up with a single phone call. You’ve gotta follow-up emails, phone calls. John Williams: What is it 12 to the 20th? John Williams: Contacted when the sale’s made, and most salespeople don’t go even past the second. Paula Williams: Exactly, so we give somebody 20 leads, and they say none of them were any good, and we’re like, well what did you do with them? Well I tried calling them, I got hold of some of them and left a message. Well did you actually talk to anybody, well maybe one or two. Well, that’s fabulous, but did you send an email, did you send something in the mail? John Williams: There’s all kinds of things to do to make the 12 plus contacts without being. John Williams: Over burden and obnoxious or whatever, overbearing. Yeah, you can do it, it just takes time. Paula Williams: And once again you want to be educational and entertaining not pushy and salesy right? Paula Williams: Okay, so that’s a follow up to hanging out with losers. Paula Williams: Which was what you were talking about. John Williams: Yeah, I mean you think about it. Paula Williams: What was the saying you become like the five people you spend the most time with. John Williams: That’s what they said, yeah. Paula Williams: Yep. Where is that from, do you know? Paula Williams: May be somebody knows, if you happen to know, put it on the comments. John Williams: Here’s an interesting stat though. John Williams: In virtually every sales organization 5% make 95% of the money. John Williams: If you are wasting your time hanging around 95% is you get crumbs. Paula Williams: I just thought it was 80 and 20 but. John Williams: That’s what he’s saying. John Williams: I’m reading it from the book. John Williams: Toxic influence are less likely be mentally sharp. So you don’t want to hang out with a lazy, the uncurious, the complainers and whiners, the complacent get to it zero [LAUGH] . John Williams: Try and associate only with winners. Only, only with winners. John Williams: I can’t even say that enough. Paula Williams: Spend twice as much time talking to a winner to make up for it afterwards [LAUGH] . John Williams: That’s right, exactly. Paula Williams: Absolutely, and number 3, Hanging Out With Losers at the Bar, Coffee Shop. Paula Williams: And that was where you said. John Williams: No additional commentary. Paula Williams: Yeah, [LAUGH] 4 Wasting Time. Which is a different category of this but it might be benign, just surfing the web, surfing around. John Williams: Yeah, yeah, you’re supposed to be making phone calls on your list and rather than that, you’re drinking coffee, chatting somebody, who knows? Paula Williams: Getting sucked down a rabbit hole [LAUGH]. John Williams: You’re just not doing it. Paula Williams: Right, and the way that I avoid that is I actually have a paper [LAUGH] calendar and I block out time during the workday. So there is no wasted time and if I want to waste time, it’s on my own time, not during the work day, right. But every single bit of time during the workday is devoted to writing articles or making phone calls or doing something, whatever that activity is. And if I can stay on task for eight hours then, I can reward myself with crazy cat videos on Facebook after the fact with no craft on the couch right. John Williams: And what he talks about in the wasting time section in this book is, you go into any auto show room and stand back and watch the sales guys. And you won’t see very many of them really doing any good. He says the two car sales guys I know each earn over 200K a year. They never take a walk in, they never stand around waiting their turn, they’re busy with appointments generated proactively. John Williams: Same thing about historical living sales people and so on, I mean, he tells you what it’s also for. Paula Williams: Mm hm, exactly, which is why we have the button on our website. Where people can schedule an appointment and that’s time that gets blocked. We don’t usually take cold calls, people calling us saying we need marketing help well, that’s great, make an appointment [LAUGH]. Let us do some research on your company, you can do some research on us. We’ll send you a package of information and then let’s sit down when you’re more educated and we’re more educated and we’re not going to waste each others time. Paula Williams: Okay, absolutely, number 5 Not Creating Systems. If you’re just winging it and just throwing spaghetti against the wall. John Williams: You’ve gotta have a process for when a lead comes in, what you’re going to do, step A, B, C, D, and so on. John Williams: It’s all follow ups in there, research is in there. Then you should have a CRM. John Williams: That helps you with this. 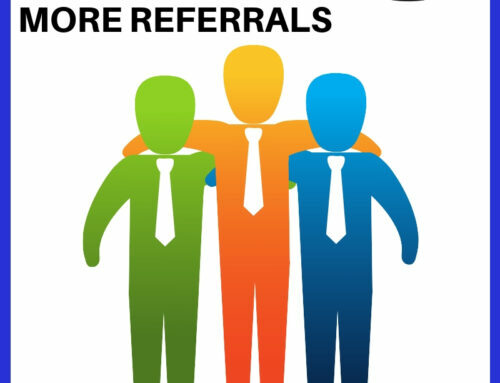 Paula Williams: Yep, and you can automate a lot of things in the CRM like, send this email to new leads, giving them some information about our company. Or about this particular product that they asked about and then put them in our newsletter list so that we stay in contact with them. But even so, we started doing this year sales meetings on Mondays where John and I go over the pipeline from the CRM and figure out who needs human being attention, right? [LAUGH] Because the CRM isn’t going to do everything. John Williams: No, it’s not. Paula Williams: Right, so we need to spend our time where it does the most good. And in some cases, we will figure out this person needs a phone call because it’s getting to the season where they are going to be to start ramping up their sales activities. John Williams: A CRM provides you with good data. John Williams: You have to do analysis on that to get information. John Williams: The information you can make sales. Paula Williams: Make plans, yeah, and then with good plans you can make sales. Paula Williams: Right, and I feel a whole lot better about this, like our CRM just told us this person wanted to start doing business with us again in September. And that was in April I think that he told us that and if I hadn’t put it in the CRM the chances of me remembering in September that we were supposed to talk to this guy when we last talked to him in April are slim and none, right. John Williams: We’ve had several of those actually that won’t talk to me next month or the month after, whatever. Paula Williams: Exactly, right, and number 6 is Poor Self-Discipline which kind of feeds into all the rest. John Williams: All the rest of that stuff. John Williams: If you’re in sales and you don’t have self-discipline you just want to go find a different job. Paula Williams: Or somebody will tell you what to do. Paula Williams: [LAUGH] Because if you don’t have self-discipline you’re going to have to find a boss who will give you self-discipline. John Williams: Either you need a sales manager to hold you accountable or the better approach is to hold yourself accountable. Paula Williams: Right, exactly. Okay, another thing that works really, really well in aviation is takeaway selling, and this is on page 197. And this really is the concept of, this is not for everyone, right? John Williams: [LAUGH] Yeah, right? Paula Williams: Your product is different, and your product is better. And not everyone is going to be interested in your product. And you are going to want to be very specifically particular about your customers. And I love the story in the book about the real estate agent that has her assistant line up calls. She has the whole sales process choreographed to where she only spends time with people who have done their homework, viewed a video. If they haven’t done the homework, she’ll have her assistant call them, confirm that they’ve done the homework. And if they haven’t, she’ll reschedule because she only wants to do business with people who qualify and who have filled out a questionnaire completely. And have done all of the research that she wants them to do and have the read the stuff that she sends them and watched the videos and everything else. And those customers, of course, are going to be more educated, and they’re going to be more motivated. And they’re going to come in in a completely different power situation than somebody who sells to everybody and who takes every call that they get. John Williams: Yeah, they can’t do that. They just don’t have time. John Williams: Maybe when you first start you have time because nobody’s calling you. But once you get a little bit of speed up and running, then there’s too many phone calls to take. You need to have somebody as part of your process. The calls come in, somebody takes those and does the first upfront. Paula Williams: Not by a machine. If you are selling a product or service that is worth thousands of dollars a year, you owe it to your customers to have a human being answer the phone. And it shouldn’t be you, necessarily, there’s lots of ways to do this. There’s services that can do intelligent triage of your phone calls. And you can hire an assistant or a virtual assistant that doesn’t even have to be at your location if you need to. Whatever you gotta do to get a human being, an intelligent human being, ideally, a kind, considerate, intelligent human being to answer your phone, right? John Williams: The only thing that phone trees are good for is that if you’ve got a product that everybody wants. And you don’t care if you get some of the people or a small percentage of the people through the phone tree, then fine. But I don’t know very many products like that. Paula Williams: Well, even the late-night infomercials, where they’re selling skin cream for 19.99 or whatever, they have a human being answering the phone. They have tried doing this automated. They’ve tried having people go to a website, they’ve tried having this be automated in some way because they’d save a lot of money doing that. Paula Williams: That is really, really true for aircraft services at thousands of dollars a month, right? Paula Williams: You want your customers to feel really well taken care of, and you want to be topnotch. John Williams: In ten years we may revisit this when AI is up and running, and you can’t tell a robot from a person. But right now, it’s not true. Paula Williams: Yeah, and you look at the demographics of aviation decision makers, and they are all 40-plus, male, college educated, da, da, da, da, They are people who expect to talk to a human and who actually still do use the phone, too. Paula Williams: Okay, so takeaway selling, it expends a lot of time on the phone. But there’s also things like information packages that you want to send people and make them read before your first appointment with them. You want to have a sales choreography that makes people feel special and makes them adapt to your process. You don’t adapt to their process because professionals have systems. People who are winging it are just freelancers, and they don’t make nearly as much money. And they also aren’t trusted nearly as much as people who actually have a system and are busy and successful and give that impression. Even if they’re not quite there yet, you want to make sure that you’re giving that impression, at least. Paula Williams: Okay, so anything else on takeaway selling? John Williams: Nope, think that covers everything from the book. Paula Williams: Okay, all right, so final thoughts. John Williams: Well, I like his approach to selling, and you can’t argue with the guy’s success. Paula Williams: But you hate salespeople, John. John Williams: You can’t argue with the guy’s success, okay? John Williams: To be able to consult with him personally, allow six or eight months advance. John Williams: You have to make an appointment six or eight months in advance. And he gets, what was it, $700,000 a day, three-day minimum? John Williams: So there you go. John Williams: Yeah, I mean, give me a break. Paula Williams: [LAUGH] Practices what he preaches. John Williams: If he can make that kinda money, I mean, he’s got something here. And like I said, we’ve been part of some of his mastermind groups and other kinds of things. And they show the data, they do a really nice job. John Williams: Yeah, you don’t go away without seeing the data. Paula Williams: Mm-hm, absolutely. And the book, I highly recommend. It’s kind of a nice approach if you’re in sales at all, and everybody is if you’re in business. If you’re a CEO of a company, your number one job should be sales, even if you are managing a sales department. John Williams: And Dan, I don’t remember when he started, but he did all the wrong things. He’ll be happy to tell you all the things he did wrong before he learned how to do this the right way. John Williams: So you may not like his style, you may not like what he says, but you can’t argue with his success. John Williams: Or the success of those that do what he says. Paula Williams: Yep, once again, really easy to read. You can get through this in a couple of hours, definitely worth the time, lots of humor, lots of fun. Paula Williams: Prevailing wisdom, and lack of common sense. So yeah, definitely, if you like the no BS style, you’ll love this book. But even if you hate this book, it’s worth getting through a couple of hours of this. John Williams: Yeah, because you’ll get a takeaway of something in it that you can apply. Paula Williams: Yep, absolutely, right, so those are the things that we think are particularly applicable to aviation. But I’m sure you probably have some different thoughts. If you’ve read the book, we’d love to hear your favorite thoughts, the parts that you thought were particularly interesting. There’s some good cartoons in there kinda making fun of the traditional sales industry and so on. All right, so next month we have the book UnMarketing, which is talking about how what’s changed and what’s stayed the same. I love this, Everything Has Changed, and everything is the same is kind of the tagline for this book. And they’re absolutely right. 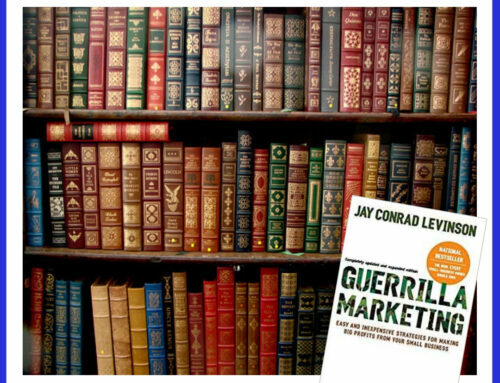 All of the principles of sales and marketing are exactly the same as they have always been. It’s still a matter of convincing people. Getting attention. Building credibility and making the sale. The tools have all changed. Paula Williams: Radically over the last five or ten years, right? John Williams: Yup. Now I suspect that the change is going to continue. Paula Williams: Exactly. So this is a nice one to get up to speed. Especially if you’ve been in the sales and marketing industry or have been in sales and marketing for a while. It’s a nice update with some great touches on new tools used to accomplish old objectives, right? Paula Williams: Okay. Cool. So we’ll be talking about that on October 4th. So if you are in our Insider Circle, please do join us. It will be fun to talk about that. 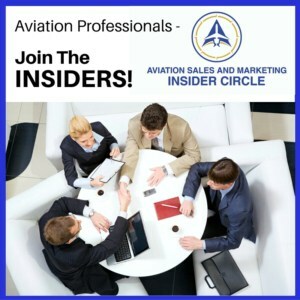 And if you are not in our Insider Circle, you may want to consider joining. It’s $279 a month and you get an hour with us. That’s actually the cheapest way to get [LAUGH] consulting from us. And then you also get, we’re just starting to do Master Minds this month. Paula Williams: Yeah, our clients together in particular venues, like aircraft sales or training or whatever the topic is that are non competing. Not directly competing with each other, but facing a lot of the same challenges so that they can work together on some things. John Williams: And that’s no joke, by the way. These guys know more stuff than you can shake a stick at. Paula Williams: Absolutely. And we always learn from each other. And they’ve always been incredibly generous with their time and expertise with each other. And what helps other companies in the aviation industry helps the whole industry. And what helps the industry helps all of us. So, I think these are very long sighted, generous people, and if you want to be involved in that, this is a great way to get a lot of help for very little money, right? Paula Williams: Okay, so, go sell more stuff. John Williams: America needs the business. Paula Williams: Absolutely [LAUGH]. That’s for our other friends, like Zeigler. So have a great month and we’ll see you next time for our next book club discussion. John Williams: See you later. Ciao.[MUSIC].. 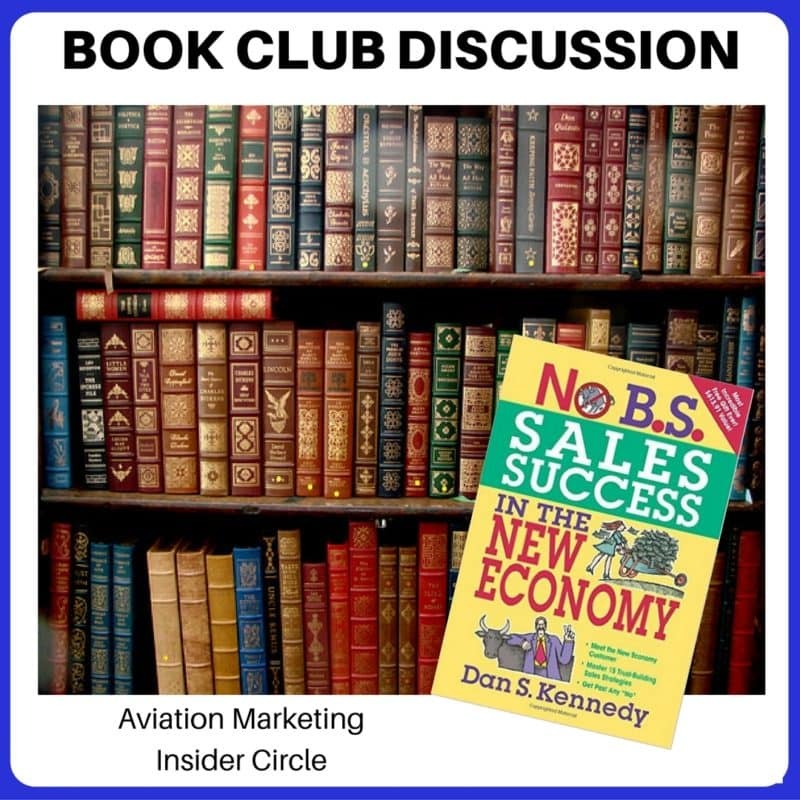 John and I discuss Dan S. Kennedy's No BS Sales Success from the point of view of what we've learned from our Aviation Sales & Marketing practice.